If the net was loaded from a file, then the net entry in the index is labeled with the name of the net. 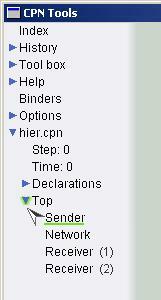 In the figure below, the net named HierarchicalProtocol.cpn has been loaded. If a new net was created, the net entry is labeled New Net.cpn. To start working on a page in the net, the net entry in the index must be opened. Click on the triangle next to the name to open the entry, if it is not already opened. Declarations: the declarations of color sets, functions, constant values, etc. All declarations are written in the CPN ML language. Color-coded auras around entries, such as the green aura next to the Top entry above, under a net overview provide various different kinds of information regarding the net. For more information about auras, please read about Graphical feedback. The Options index entry in a net overview provides an overview of the options that are related to a particular net. The Output directory option determines where various kinds of output files will be saved. 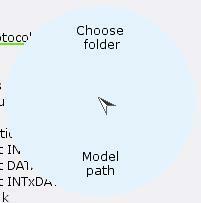 The default output directory is indicated by the text <same as model>, but the default output directory is actually <model-dir>/output/ where <model-dir> is the directory in which the model is saved. To change the output directory for a net, edit the text of the option. The output directory can be specified either as a relative path, e.g. ../simoutput/, or an absolute path, e.g. C:\\Documents and Settings\\userx\\. If a relative path is used, it will be interpreted as relative to the directory where the model is saved. 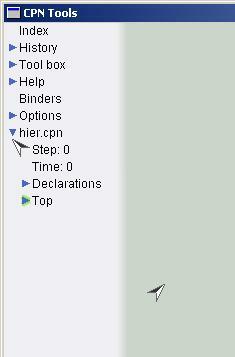 The Output directory marking menu can be used to specify absolute paths. The Performance report statistics options are used to determine which statistics should be included in different kinds of performance output. A check mark next to a statistic indicates that the statistic will be included in the appropriate report. The Simulation performance report options are used to select the statistics to be included in simulation performance reports. 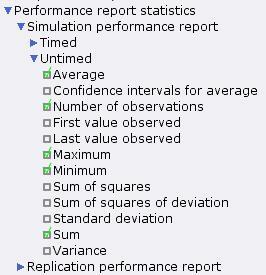 The Replication performance report options are used to select the statistics to be included in replication performance reports. All pages in a net are accessible through the index. The hierarchical structure of a net is reflected in the index. The entry for a subpage appears under the entry for its superpage, and the entry for the subpage is indented with respect to the entry for its subpage. Subpage entries are visible in the index when the corresponding superpage entry has been opened. Opening the entry for the Top page shows that it has four subpages: one instance of the Sender and Network pages, and two instances of the Receiver page. If you have created a new net instead of loading one, there will be only one page, called New Page. This page is created automatically with the new net, and is empty so you can start creating net objects on it.